The shuttle Discovery glided to a picture-perfect docking with the International Space Station Saturday, the veteran spaceplane's 13th and final linkup with the orbiting outpost. 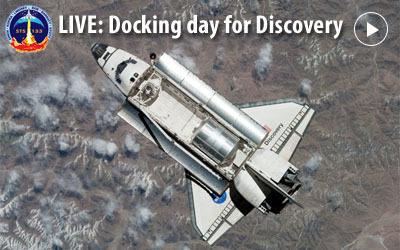 With commander Steven LIndsey manually flying Discovery from the aft flight deck, the shuttle's payload bay docking system engaged its counterpart on the front end of the station's Harmony module at 2:14 p.m. EST (GMT-5). "Station and Houston, Discovery has capture confirmed," an astronaut radioed. The historic linkup marked the first time in the station's 12-year history that spacecraft from the United States, Russia, the European Space Agency and Japan were docked at the outpost at the same time. Later in the mission, if all goes well and mission managers concur, three station crew members will undock in a Russian Soyuz spacecraft to photograph the lab complex and all the visiting vehicles from afar, capturing a unique moment that, with the shuttle's looming retirement, will never be repeated. But first, the combined crews have to complete the primary objectives of Discovery's mission, including attachment of a final U.S. module, loaded with critical supplies and equipment, and an external storage platform carrying a spare set of radiator panels. With the shuttle attached to the station, and with all of the visiting vehicles attached, the combined shuttle-station complex masses some 1.2 million pounds. It took longer than usual for relative motion between the two spacecraft to damp out, allowing the docking mechanism to firmly lock the shuttle in place, but it wasn't immediately clear if that was due to the mass of the vehicles or some other factor. Running about 45 minutes later than planned, a final hatch between Discovery and the station was opened at 4:16 p.m. and 20 minutes after that, Expedition 26 commander Scott Kelly, Alexander Kaleri, Oleg Skripochka, Dmitry Kondratyev, Catherine Coleman and Paolo Nespoli welcomed Lindsey and his shuttle crewmates -- pilot Eric Boe, Al Drew, Stephen Bowen, Michael Barratt and Nicole Stott -- into the space station. After a mandatory safety briefing, Bowen and Drew moved their spacesuits and tools into the station's Quest airlock in preparation for a pair of spacewalks Monday and Wednesday. Barratt and Stott, meanwhile, used the station's robot arm to pull external logistics carrier No. 4, carrying a spare set of radiators for the station's ammonia coolant system, out of its mount in the shuttle's payload bay. The goal of the operation was to attach ELC-4 to capture fittings on the underside of the station's right-side solar power truss. To get it there, Barratt and Stott first had to hand the pallet off to the shuttle's robot arm, operated by Boe and Drew. The station arm then was repositioned, inchworm fashion, moving from the Harmony module to its mobile base work station. When the move was complete, the shuttle arm handed ELC-4 back to the station arm and the pallet was slowly moved into position for attachment to the solar power truss for future use as needed. Because it took longer than expected to complete the docking procedure, the pallet work was not completed until 10:12 p.m., well behind schedule. But the astronauts, given the option to defer installation to Sunday, opted to press ahead. "It was really very impressive, working from the cupola and watching how the arms worked together and getting ELC berthed to the truss," Stott radioed. "Thanks for those words, Nicole, and you guys rock," Stan Love replied from the space station control room in Houston. "It was wonderful watching you from here." The ELC move capped a busy day in space. Lindsey and Boe began the terminal phase of the rendezvous at 11:33 a.m. with a rocket firing to begin closing the final 9.2 miles to the station. Just after 1 p.m. with the shuttle poised 600 feet directly below the lab complex, Lindsey guided Discovery through a routine-but-still-spectacular end-over-end backflip maneuver, allowing the station crew to photograph the orbiter's heat shield. Working in the Russian Zvezda command module, Coleman and Nespoli photographed Discovery's heat shield, using 400 mm and 800 mm telephoto lenses respectively, as the orbiter flipped about. The images will be downlinked to analysts in mission control at the Johnson Space Center for detailed evaluation. During Discovery's launching Thursday, several pieces of foam insulation fell away from the ship's external tank, including some that appeared to contact the shuttle's heat shield. The foam shedding occurred well after the first two minutes and 15 seconds of flight when the dense lower atmosphere can cause debris to hit with a high relative velocity. Engineers do not believe the foam lost Thursday caused any significant damage and nothing out of the ordinary could be seen in television views of the maneuver. But the photos taken by Coleman and Nespoli will be carefully scrutinized to make sure. It took about 10 minutes to complete the rendezvous pitch maneuver. After that, Lindsey began moving Discovery in an arc up to a point about 300 feet directly in front of the space station with the shuttle's nose pointed toward deep space and its open payload bay facing the front end of the lab complex. From there, Lindsey guided Discovery in to a docking at pressurize mating adapter No. 2 on the front end of the station's Harmony module. "What took you guys so long?" Kelly joked earlier during an initial radio hookup. "Yeah, I don't know, we kind of waited until like the last two seconds," Lindsey replied, referring to Discovery's launch Thursday in the final seconds of its window. "But it's good to hear your voice, Scott, you guys look great. We're on our way."